Man, time flies when on vacation. If it wasn't for Story Time Saturdays and Our Crazy Boys' sweet and sassy Becca sharing a story today, I really wouldn't know what day of the week it was. Becca is reading Big Sharks to Jack and is hoping you sit in for a peek. 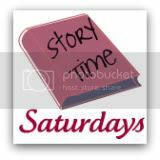 She's also hoping you like the Story Time Saturdays button she created for me, because she's that kind of cool. If you've read, plan to read, or just want to throw blog traffic my way because you are crazy nice like that, why not jazz up your blog with some flair? For now, enjoy the story. And be sure to stop back next Saturday for a new one.